MARKHAM, ON, Oct. 27, 2015 /CNW/ – Chances are, you know a family caregiver. Or you are one yourself. One out of every four Canadians today devotes significant time, energy and resources to caring for an aging parent or someone with long-term health needs. But who is caring for the caregiver? Saint Elizabeth, Canada’s largest social enterprise, today is launching Elizz, a breakthrough new brand dedicated to all things caregiving. Elizz is designed to arm caregivers with the support and tools they need to better care for their family members – and themselves. There are more than eight million caregivers across Canada, a population that is expected to increase to roughly one in three Canadians by 2020. These Canadians are often faced with the difficult task of balancing work and busy personal lives with the demands of caregiving, which can range from helping out with everyday activities to providing 24/7 care and support. Currently, 74 per cent of caregivers do not believe they have complete access to the resources they need. From a DIY Caregiver website, to virtual advice through caregiver coaches and nurse advisors, to health care services provided in the home, caregivers will find it all in one convenient place. Elizz.com also features a caregiver portal offering a simple and safe way to track documents and appointments, as well as a personalized social network for individual caregivers to manage their situation and connections with family and friends. These virtual supports and tools combined with home care services make Elizz a powerful resource for caregivers, helping to make their lives less stressful. 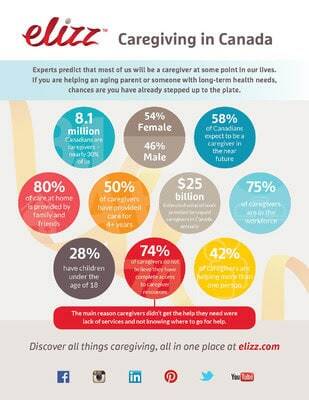 For more information, Canadian caregivers can visit elizz.com or call 1-855-Ask-Eliz.